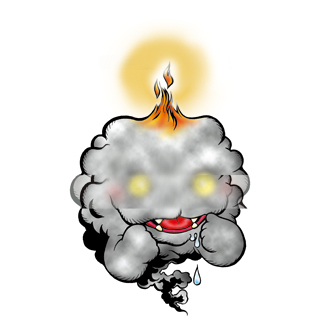 A Baby leveled Digimon with smoke-like gas covering his body. All Digimon have a Digi-Core in the center of their bodies, but Mokumon's is completely bare; he emits smoke to cover it up from the sight of enemy Digimon around him. He also blows smoke to blind his opponents while he runs away: this is translated as his "Smoky Blow" attack.